While no two cars or tracks are the same, some analysis might answer questions like, "What percent of the time does my car's ultimate accelerative capability really matter?" or, "What percent of the time does my car's ultimate lateral grip really matter? ", "How much of the time is my car's extra width hurting, or maybe helping me?" While I've spent plenty of time looking at event and tuning data over the past several years, I hadn't previously performed this sort of analysis on an autocross course before. While the results weren't exactly surprising, it provides a way to put into perspective what we're really doing out there most of the time. A lot of regions suffer from tiny or poorly-shaped lots, and unimaginative, or even worse, over-imaginative course designers. One of the great things about Nationals, is the courses are always very good. I've been seven times, driven fourteen courses (well, thirteen since one was flooded), and they've all been excellent. Even at National Tours or Pro Solos you'll occasionally come across a real stinker course, but for Nationals there's really a lot of care that goes into things. The course I've chosen to highlight is the West Course from the 2010 SCCA Solo National Championships, which as of this writing, should still be fresh in the heads of any autocrosser that ran it. The course was designed by Roger Johnson, who many believe to be the best course designer in Solo. Roger teaches autocross course design classes and has written a manual on course design - you can download it here. While all courses vary, this is a superbly representative sample of the sort of course one would encounter at a good SCCA event. The driver is yours truly, in a Super-Stock prepared 2004 Dodge Viper SRT-10. While the run is far far from perfect, it is nevertheless one of the ones I'm least embarrassed to share. The video is a useful aid, as the perspective should be familiar. On that note - the best video IMO is the one that shows both your inputs, and the view forward with a decently wide angle. Views that don't show driver input, or show input but not the course, are not 1/10th as helpful as one that show both simultaneously. As you'll see here, things happen way too quickly to try to split it up on video alone, the data is the key. Here to follow are several screenshots of the analysis being performed. Below this is the first. On the far left is a track map (collected via GPS data from my DL-1 data acquisition system), illustrating by color, the lateral acceleration (turns left and right) generated around the course. To its right is a similar map, this one displaying a similar output for longitudinal (accelerating and braking) accelerations. Further to the right, is our now-familar g-g diagram, again in a shape resembling an acorn, though this one keeps to its edges a bit better than our 240's acorn in chapter 1. At this point I only have a rough start and finish line mapped out, so we only have a time. This is perhaps a good time to mention, the value of a data acquisition system. For most people, a time slip is all they get after a run. All the variables about their car setup, how they chose to drive, the cost of any mistakes they made - it's all wrapped up into just a single data point - a time. While time is what really matters in determining finishing position, there is a lot to learn from taking a look at everything that happened during the run. This wasn't forced or planned, but it works out to an awfully neat 80/10/10 split. Now, one thing that's for certain, is these values will be different for every car. Even within the Super Stock class, there's a lot of difference between a Lotus Elise, a Corvette Z06, a Porsche 996 GT3, and a Dodge Viper, even though all four seem to run really similar times on most courses. This same analysis done for the Lotus, would show a higher percentage of the time in the Pure Accel stage, and less in Transitions. The reason for this, is the Viper accelerates better than the Lotus, and it's bigger. As such, it gets through acceleration zones in less time, but then has to spend more time at its limit of transitioning/slaloming, because it can't get through that portion as quickly as the Lotus. The reason why the Lotus can slalom more quickly than the Viper we'll cover later in the Transitions chapter. Some of the time we spend at the limit of lateral and longitudinal accleration, those are the really fun parts of the course we'll get into more later in the Entry and Exit chapters. You may also note that some legs of Skidpad or Transition have elements of accelerating and braking to them. It is rare that you get to spend much time in a steady-state corner or constant-speed slalom, but such times do exist. I've included some extra data here, a "values" chart. You can see that in the 1.42 seconds spent in this sector, the Viper picked up 17.4mph, going from 30 to 47. Over on the g-g graph, the dark section of line is way up above the normal upper portion of our friction acorn, with the longitudinal acceleration peaking around .73g - that's because we're in first gear, and we're not pushing the car too hard laterally. 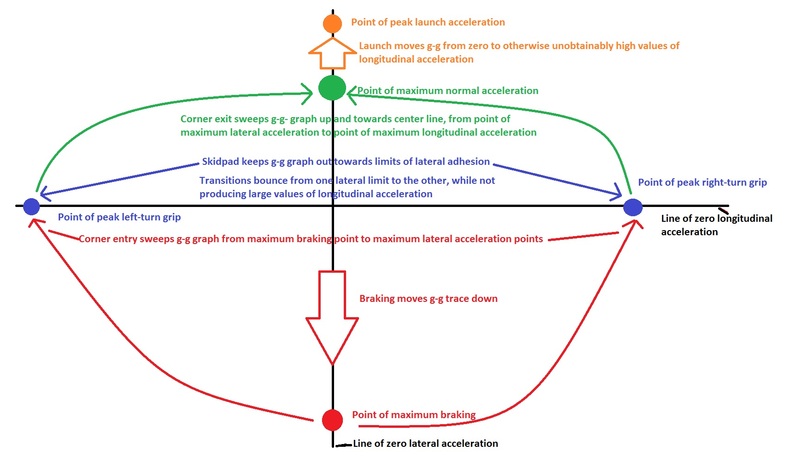 Next up is transitions - I've chosen the leg immediately following our acceleration run above. You can see how the g-g graph picks up right where we were at the end of the acceleration run, and takes us into the left-right-left complex of transitons to follow. In this series there's some accelerating and braking, but the big story is the swing side-to-side of our g-g trace. Time spent in this section: 6.08 seconds. This is a pretty boring section to look at, but in .59 seconds, the car scrubbed off 10.5mph, and did almost 1.1g of braking, even though it was also being asked to do 1g of lateral acceleration too. This almost should qualify as a corner entry event but hey it's the closest thing to straight line braking here! Next is a corner exit phase, coming out of the skidpad we broke in to just before. The thing that makes this a corner exit, if you hadn't driven it, is shown in the values table - lateral accel goes from 1.156 to .912, and longitudinal accel goes from .208 to .587 - that shows a tapering off of cornering, and a gradual increase in acceleration. Although in the g-g graph you just see the bolded line, in a corner exit, it goes from one of the sides, up and back towards the center. Later we did a partial skidpad. One of the visually more tricky parts of the course, was a nice constant-radius corner of about 100 degrees, at least in the Viper. 2.73 seconds spent here, all of it right at the limit of what the car could do turning left. A little acceleration but the longitudinal is centered mostly around zero. 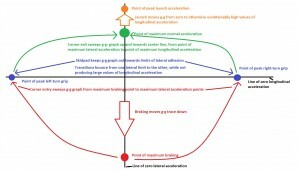 As the brakes are applied, the g-g graph swoops down to max braking, then works its way around the friction acorn towards max lateral acceleration. While this shows corner entry going from max braking to max lateral, it doesn't always have to be that way; a corner where you only have to lift, might cause a sweep from max accel to max lateral. Entire books have been written on the subject of race car data acquisition and analysis, and all of this is just scratching the surface. We haven't gotten in to throttle postion sensor, steering angle sensor, brake pressure sensor, suspension shock position sensors, etc. Long story short, there is a tremendous amount to be learned both as a race car engineer but also as a driver, from the data. Some people out there are talented enough to win championships as drivers or engineers without studying their data; for the rest of us mortals, it is a valuable tool that can help us close the gap on the "aliens" among us. One spends much more time at the lateral limit than the longitudinal limit, in a Super-Stock Viper on a representative Nationals course. As we move into analyzing how different cars will do at the different events, this should help us keep everything in perspective. Even though lateral is the name of the game, we can't be so off in longitudinal acceleration that we're losing a ton of time there - when championships are won or lost by tenths of a second, we have to be in the game for all events on the course.